The aim of this project is to demonstrate that local short chain systems using biomass from landscape elements for local energy or heat production are economically feasible. Through realizing these short chain systems and bringing together experiences from different partners and regions in North Western Europe, we want to demonstrate that this currently unused biomass from landscape elements can contribute to local sustainable energy production, with respect to ecological, social and cultural aspects. Collate available knowledge, experience and information about all aspects of realising the economic potential of using biomass on a local scale. Develop a basic planning tool to make the utilisation of biomass from landscape elements possible, taking into account ecological and social constraints. Jointly work out a specific application of the planning tool for each partner region and test it in pilots of local short chain systems using biomass from landscape elements in different parts of the NWE region. Integrate the knowledge and developed tool in local, national and European policy. We have worked with farmers, land owners and the local community to develop a pilot energy co-operative using woody biomass from local landscape elements. The project has brought farm hedges back into focus and sought to answer questions about whether biomass can be sustainably and economically harvested from hedgerows, and as such, whether hedges can be a viable source of woodfuel? Over the course of the project we have looked at these questions from various different angles investigating the impacts of hedge harvesting on our resident dormice population, hedgerow flora and soil carbon dynamics. We have tested machinery big and small to identify the best harvesting methods, weighed woodchip and measured our hedges, interviewed farmers and provided training and discussion forums to really get to the bottom of these questions. A protocol to monitor the impacts of hedgerow harvesting on the biodiversity of a hedge network. The best practice guide is based on the machinery trials carried out on Elm Farm and Wakelyns Agroforestry. It also pulls together current and previous research, related projects, policy recommendations and management guidelines. 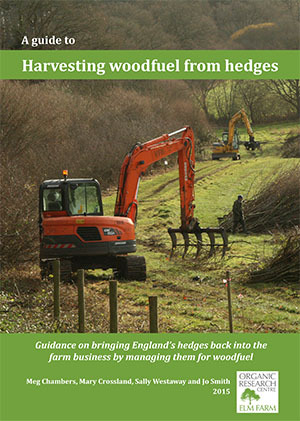 The guide is aimed at farmers and landowners, agricultural and forestry contractors, conservation organisations and local authorities interested in managing hedges for woodfuel. It focuses on the logistics and practicalities as well as methods and machinery selection. It outlines how and why you might manage your hedges for woodfuel, includes advice on how to select appropriate hedges, how to plan the management, what the machinery and processing options are as well as the economics and any legal considerations. The protocol is designed for use by farmers, landowners and advisors and is largely based on a set of indicators selected to provide quantitative links between, for example, habitat quality or structural diversity and biodiversity. Indicators were selected using a range of sources including a review of current literature and a synthesis of existing knowledge. Methods for measuring each indicator were tested in the field during the protocol development phase. The protocol consists of three main components: an Excel assessment tool, a User guide, and a series of surveys (with accompanying survey notes) carried out on the hedges and on associated taxa (butterflies, bumblebees, birds, and ground flora). Growing local energy. Hedgerow harvesting machinery trials report.